At one time, almost all computer use was done in a traditional office or work setting. Progressive employers soon recognized the risks of injury and poor ergonomics to productivity and provided their employees with workstations in order to mitigate those risks. Now, more people than ever are working on computers at home whether it be for work (self-employed, teleworking for an employer) or leisure activities (social media, paying bills, online shopping, game playing, etc.). People tend to be reluctant to invest in ergonomics at home, especially if there is no financial support or encouragement from an employer. Purchasing the proper furniture may seem pricey up front; however, there are many benefits to investing in quality pieces for your home office. They will last much longer, better meet your needs than typical one-size-fits-all solutions, and will save you money in the long run. In this post, we will highlight some of the possible differences between working at home and working at the office that could put your productivity and health at risk. If the desk is not designed for computer use, it may have a thicker top or drawer, reducing the amount of space available between the top of the thighs and top of the desk. Table 1 recommends seat heights and support surface heights for input devices for a small female and a large male not wearing shoes. There are many more chair and desk characteristics that contribute to proper ergonomics, but for now we will focus on just these. The above numbers are guidelines only and should not be the sole determinant of these work station parameters for individuals of the specified heights. From Table 1, you can see that there is no single height for a chair or work surface that will work for everyone. Consequently, adding adjustability to at least one of these parameters (i.e. the chair or the desk) will increase the likelihood of fit. Adjustability is especially important for multi-user spaces, particularly when the users are different sizes. Most office chairs are height adjustable; however, sometimes the range of adjustment is not sufficient. If you are too tall for your chair, you may think that using a seat cushion is your only option, which is certainly not the case. Replacing the pneumatic lift on your chair with one that has a higher range will increase the chair’s maximum height, helping you to achieve the proper posture. On the other hand, if your chair is too high for you (your feet should be comfortably on the floor), a properly sized footrest will provide the support you need. Alternatively, there are also shorter pneumatic lifts available to lower the overall height range of the chair, which can negate the need for a footrest. The modular nature of ergoCentric chairs like the tCentric Hybrid, makes it easy for people to swap out pneumatic lifts, seats, arms, casters, headrests and lumbar supports. There are many advantages to having your feet on the ground but that is not always the best outcome if you have a fixed height desk. A typical desk or dining room table is 29” high. While this is a good height for someone who is quite tall, we can see from Table 1 that it can be 8” or more too high for some people, or in some cases even too short for very tall people. 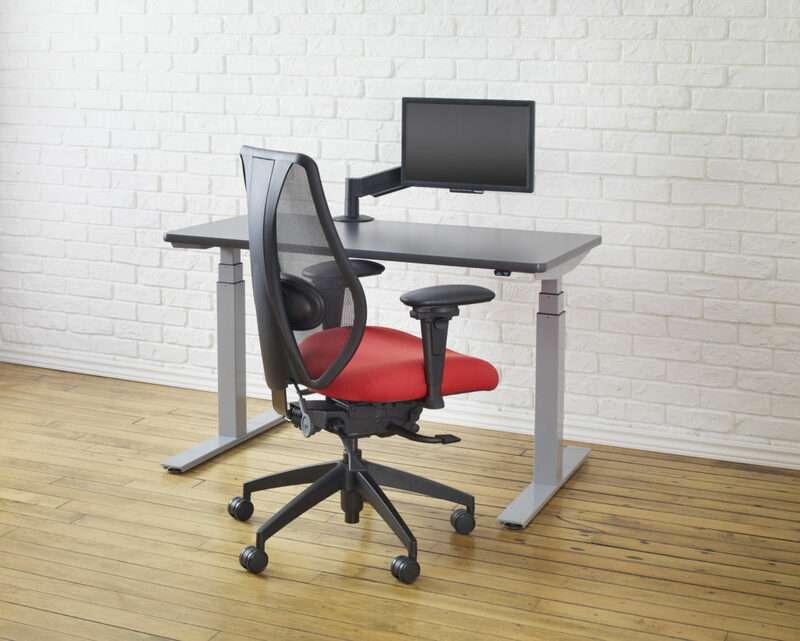 The best way to achieve the correct posture, regardless of height, is to invest in a height adjustable table. This way, you can independently adjust your chair to the correct position, and then adjust the height of the table accordingly, reducing the strain on your neck, back, shoulders and other parts of the body. When working at home, there is the increased likelihood that you will be using a laptop computer. The main challenge with using a laptop is that the screen is connected to the keyboard, so the screen and keyboard are not independently adjustable in height. If the laptop is at a good height for typing, chances are that it is too low for looking at the screen and vice versa. If it is at a good height for looking at the screen, it may be too high for typing. The best solution for long term laptop use is to plug in an external keyboard and mouse and/or an external monitor, so these devices can be independently positioned at their own comfortable height. Another risk associated with using a laptop at home is that there may be more opportunities for working in awkward postures, such as sitting on a couch or lying in bed. If you are using a laptop on your lap, your neck will be bent forward. Avoid this position as much as possible. We all know that exercise is essential for overall health. You might be getting less of it when working at home. You may be walking less because you are not commuting to and from an office, not going to meetings, etc. Make sure that you make time for exercise when working at home. Poor ergonomics can be tolerated for short periods of time but the longer the exposure, the greater your risk will be. We may find all the interruptions at a traditional office annoying but they can have a health benefit. Those interruptions are providing micro-breaks that give overworked muscles and joints time to recover. At home, there may be fewer of these interruptions resulting in fewer breaks from prolonged computer use. There are many reasons why computer users experience discomfort. Some may be exacerbated by working at home. It is important not to ignore discomfort and to address the possible causes of it. At best, discomfort is an annoyance and can inhibit productivity. At worst, it can lead to injuries and/or disabilities. The employer ultimately ends up paying for this through lost productivity, wages and compensation costs. Additionally, each time you replace or repair a low-cost chair (even if only once every few years) its total cost to you goes up. All factors considered, investing in the proper furniture initially is essential to ensuring your health, comfort and productivity in the long term, as well as providing you with the lowest total cost of ownership. You can also use some ergonomic products like sit-stand desk, ergonomic chairs, and many more to have a stress-free and healthy office environment.